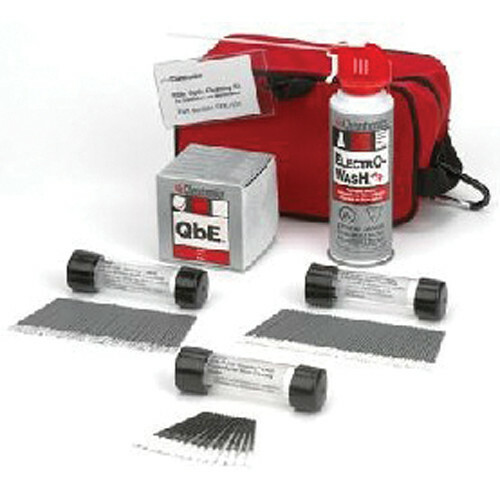 ITW Chemtronics has included all the cleaning supplies necessary for a successful fusion splice and 2.5mm fiber optic connection in this beneficial kit. Electro-Wash PX Precision Fiber Optic Cleaner and QbE Cleaning System are also included for performing the CCp. Swabs and wipes are included for cleaning the fusion splicer and work area. Swabs are also included for cleaning ferrules, alignment sleeves and backplane connections. Electro-Wash MX Premoistened Wipes are included for fiber tool and cable wiping. All the swabs are packaged in rugged tubes for field operations. The kit bags are made from tough nylon for long life. They are equipped with a carabineer to clip on a tool belt for transport or to clip a cable for convenient access.